If you love the down-home flavor and filling satisfaction of a good potato dish, you’ll love this hearty sausage and crispy potato roast. With simple but full flavor and a beautiful presentation, it will become your new go-to dinner dish. 1. Begin by preheating your oven to 375°F, then mix your oil and melted butter in a small bowl. Brush a round 9-10-in. baking dish with the butter and oil mixture. 2. Slice each peeled potato thinly crosswise, keeping the slices held together in the shape of each potato. Then, arrange your potatoes with the slices vertical in your baking dish. Wedge your onion slices between your potato slices, about three or four to each potato. 3. Brush the potatoes with your remaining oil and butter mixture and sprinkle with salt and red pepper flakes. Place in the oven to bake for an hour and 25 minutes. 3. Keep the potato dish covered with aluminum foil for the first 30 minutes of baking, and make sure to spoon some of the oil and butter mixture back over the potatoes occasionally while they cook to keep them from sticking together. 4. While the potatoes roast, saute your sausage meat in a small pan on medium-high until browned and firm, stirring occasionally. When crisp and brown, drain with a paper towel and set aside. 5. 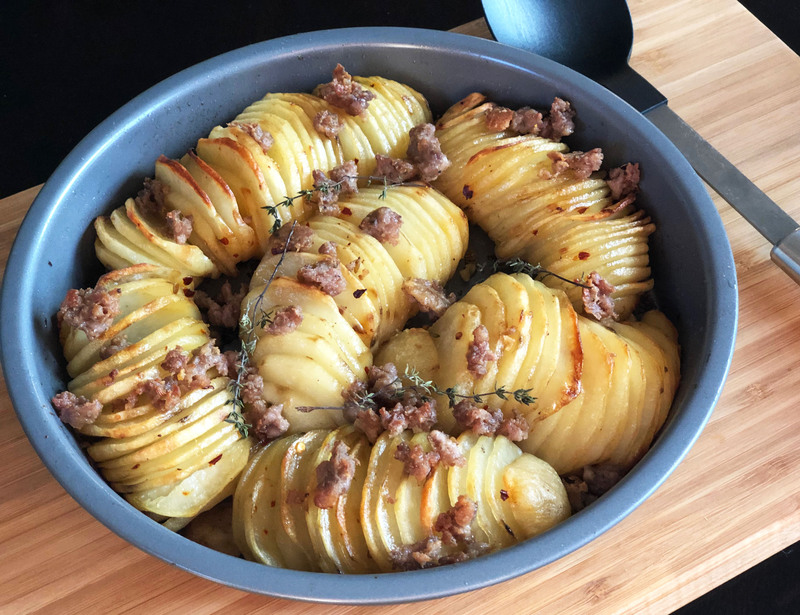 Remove your potatoes from the oven, scatter your sausage meat over and between the potatoes, then lay your thyme sprigs on top and bake for another 35 minutes. Remove from the oven, sprinkle with a bit more salt and serve hot for a comforting treat. Love the addition of our Sweet Italian Sausage Meat to your crispy potato roast? Try all our delicious Premio sausage varieties today when you search for our products in a store near you.